After having my iPhone 3G for almost a year, I am now able to record videos on it!!! Thanks to the recent apps that were released on the App Store! The picture above shows the most recent apps I've downloaded there (the ones on the red box). They are mainly for the enhancement of the camera feature of the iPhone 3G. First, the iVideoCamera and the Camcorder. Both of them are just $0.99 each and with that price you can already record videos on your iPhone 3G or 2G. It's quality is obviously not as good as the iPhone 3GS. It's just enough to make you see moving frames although the developers stated, "We will be enhancing the frame rate and quality soon." So with that stated, I am expecting it to be much better in the next few months perhaps. :) Although the Camcorder does seem to have a better quality than the iVideoCamera, i would still prefer the iVideoCamera just because I can actually import the file to the computer and even upload it directly on YouTube or Facebook. Pretty nice feature. Here is a sample of a vid I took earlier. 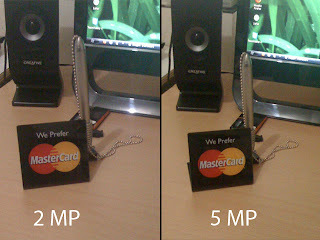 The 5.0 MPX app you see above, as its name implies, turns your iPhone into a 5 megapixel camera. My iPhone 3G only has a 2MP camera so it does improve the picture quality really well. It would really come in handy if I would want to take better looking photos. It only cost $0.99 too. Lastly, the PS Mobile or the Photoshop Mobile app. It is free but the features are limited to crop, exposure, some effects, tint, rotate, flip and sketch. I don't know if I missed some but those features are the basic ones that you would probably frequently use for photo enhancement. So there, iPhone 3G or 2G users, these apps will greatly improve the camera feature of your phone. Grab it now while it is still $0.99 on the app store!